If you are on the mobile app, click here. A) Where to check for open shifts? Each time new open shifts are published you will be notified. B) How to apply on an open shift? Click on "Open shifts available"
Click on the empty circle left of the offered open shift; a white check mark within a purple circle will appear (see orange arrow). C) How to verify the status of my open shift requests? 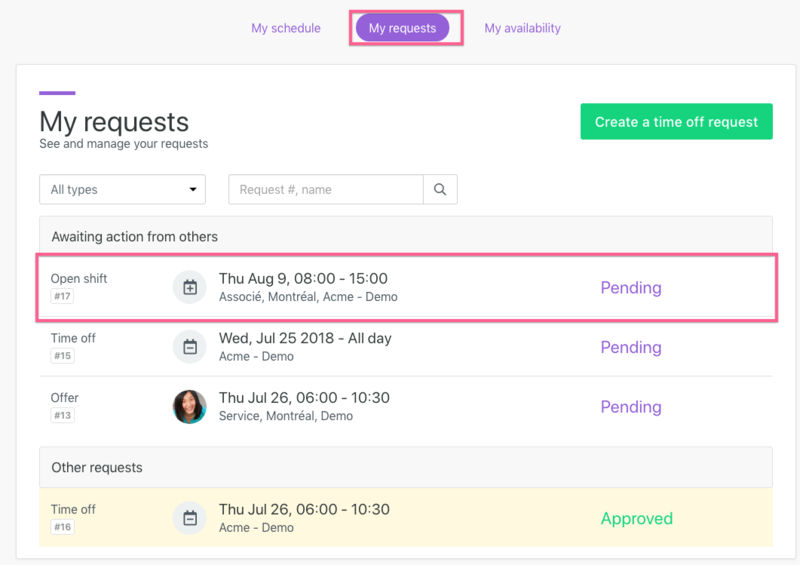 If the manager assigns the open shift to you, you will receive an instant notification and the field "Request updated" will show a new activity. Until then, you will be able to consult the status of your request or even know if it has been filed by someone else, through the "My request" menu. If you changed your mind or if something came up and you must cancel your open shift request. Simply click on the open shift request and leave it. PS: If the open shift has already been assigned to you, you won't be able to cancel it. You should write to your manager.